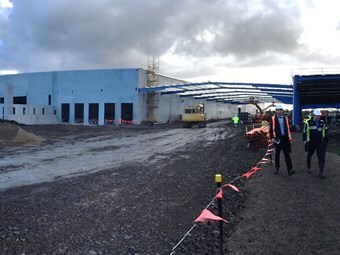 Epping supersite under construction in Melbourne. Global logistics company Mainfreight has outlined its recent infrastructure changes across its Australian network, building or expanding branches in Western Australia, Queensland and Victoria. In Western Australia, the company has opened a satellite depot in Bunbury, 170km south of Perth. The depot now serves as a pick-up point for a number of owner drivers in the region, who deliver freight to Brusselton, Dunsborough, Augusta, Albany, Collie and Margaret River. The company’s Logistics, Air and Ocean team in Perth also has a new facility in the state with 10,000 square metre of warehousing space located at the airport. The transport arm, however, will have to wait until October to move into a purpose-built supersite that is being constructed on 3.2 hectares. In Queensland, a refurbishment and extension completed this month has doubled the capacity of Mainfreight’s Townsville depot to 2,870sqm. Mainfrieght’s dedicated in-house wharf cartage division, Owens Transport, has moved into a new 1,500msqm depot in Brisbane after it was also completed this month. The new location resides inside the Port of Brisbane and has 10,000sqm hardstand space. In Victoria, the company has a new freight development consisting of two buildings, for transport and logistics services, joined by a breezeway. The supersite sits on 11ha in Epping, close to the main road between Melbourne and Sydney, the Hume Highway.